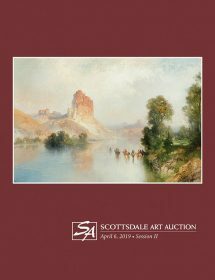 Scottsdale Art Auction celebrated its 15th Anniversary with a $13.2 million sale on Saturday, April 6th. 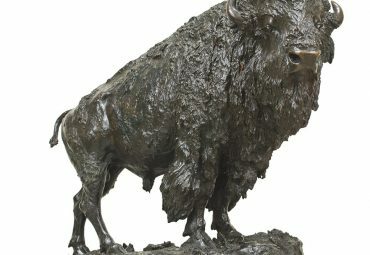 Top lots sold included Frank Tenney Johnson’s Smoke of a .45 for $669,000, Martin Grelle’s Offerings On the Wind for $435,750, and world records for Henry Shrady’s Elk Buffalo $380,250, Melvin Warren’s Remnants of the Herd, for $497,250, Logan Hagege’s Breaking Through the Storm for $234,000 and $99,450 for Mark Maggiori’s Electric Desert. When the final hammer fell over 94% of the 346 lots offered were sold. 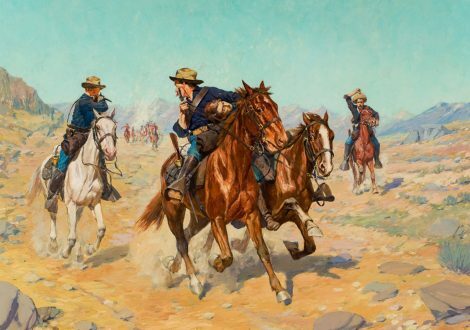 Scottsdale Art Auction is seeking consignments for our April 4, 2020 auction of fine Western paintings and bronzes from masters of the genre as well as the finest works from contemporary Western painters and sculptors. 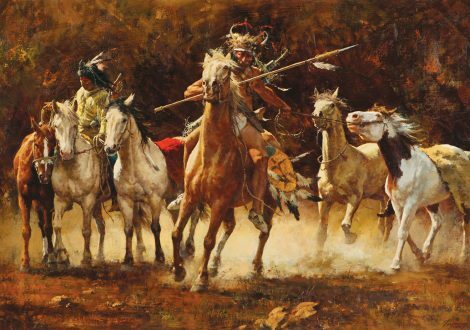 A consortium of leading American art dealers has organized a western art auction to be held in Scottsdale, Arizona in the spring of each year. 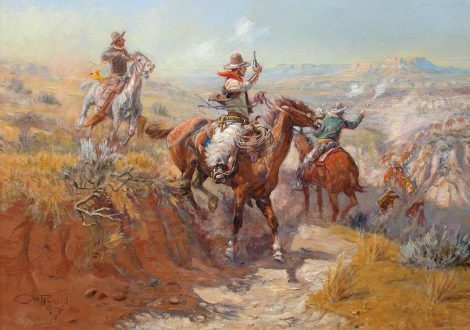 Under the banner, Scottsdale Art Auction, dealers Mike Frost (Bartfield Galleries of New York City), Jack A. Morris, Jr. (Morris Fine Arts, Hilton Head Island, SC) and Brad Richardson (Legacy Galleries of Scottsdale, Arizona and Jackson Hole, Wyoming) joined together and presented their first sale on April 2, 2005 at Richardson’s Legacy Gallery on Main Street in Scottsdale, Arizona. Currently Holding 223 Art Auction Sales Records. With 2018 setting 48 new records. Average of 96% of all lots sold in 2018. Lowest buyer’s premium in the industry, 17%. Fair, simple and straightforward commission with no hidden fees. 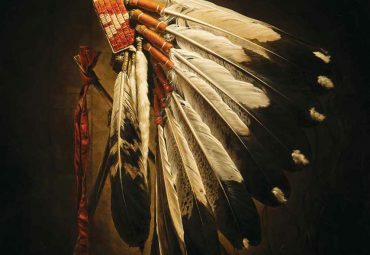 A partnership with over 100 years of experience in the field of fine art. 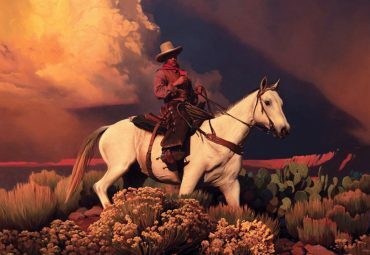 Extensive mailing list of collectors from noted art markets; New York, Jackson Hole, Bozeman, Hilton Head, Scottsdale. 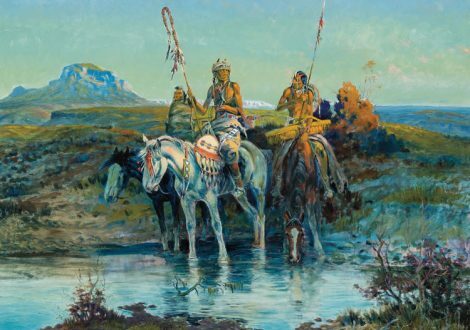 Permanent onsite sale & showroom — art is displayed in a beautiful gallery setting, not a hotel, for consistent year round viewing for your consignment. Advertising in more than ten national publications as well as online advertising. Order your 2019 catalogue today! 2019 catalogues will ship middle of March.